Dearest most beloved and respected Heavenly Parent, now is the start of the year 2013 by the Heavenly Calendar; the long awaited year. It is the year in which we will celebrate Foundation Day together with True Parents. All of the things on this earth, and the spirit world are coming together under a single heart and mind in order to start this New Year. Today I offer my thanks to you. Heavenly Parent, you have gone through a very sorrowful time in history in order to greet this Foundation Day due to the fall of the first human ancestors. The Providence of Restoration through Indemnity was carried out in order to rectify this wrong. And many Central Figures were appointed in order to carry out Your providence. And it was through their sacrifices and through their efforts throughout history, which You anxiously looked over, that history has flowed to this day. In particular on the foundation of the victorious foundation of True Parents, the Coronation of God's Kingship was held January 13, 2011 and since that Proclamation for twelve years True Parents has be living each day as if it was a thousand years and a thousand years as if it was a day investing themselves completely with life or death resolutions to this day. And during this time True Parents proclaimed the start of the Era After the Coming of Heaven and also offer the Coronation to You allowing Heavenly Parent to firmly establish himself on this earth. 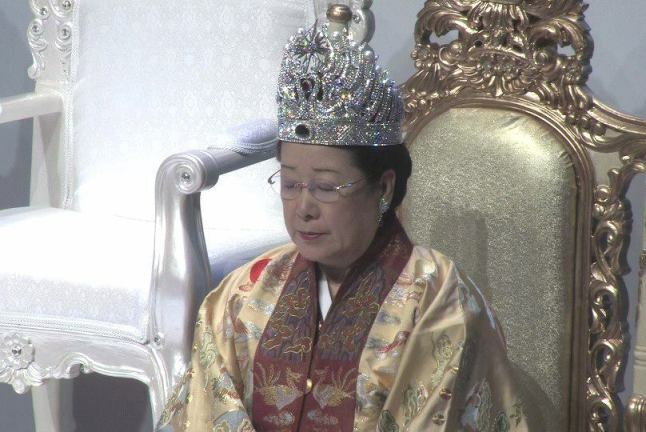 And to all of humankind and to this universe True Parents held a coronation and enthronement ceremony that allowed God to be liberated completely. Beloved Heavenly Parent, now we have twelve days left until Foundation Day. We really truly want to repent for all our responsibilities which we failed to fulfill now centered on True Parents, the True Family and also all the Blessed Families. Let us all become as one in heart, in body, in mind and in form(?) to all become a total living offering before You that can be used in order to create a new environment for your purpose. I pray that all the members of the Unification Family worldwide can unite with the Will of True Parents and pledge to fulfill their responsibilities and missions as Tribal Messiahs and use this as a new opportunity in making a new beginning. This I proclaim now in the start of the First Year of Cheon Il Guk in the year 2013, by the Heavenly Calendar, we pray that all of the people of this world can welcome and usher in this truly amazing Era of Peaceful Reign and Prosperity. May True Parents' and Heavenly Parents' blessings overflow in each and every one of us and all of this I sincerely pray in the name of the True Parents. Aju, Aju, Aju.